Keep Azure Function assemblies monolithic, or be prepared to work deal with mismatching Azure Storage assemblies. 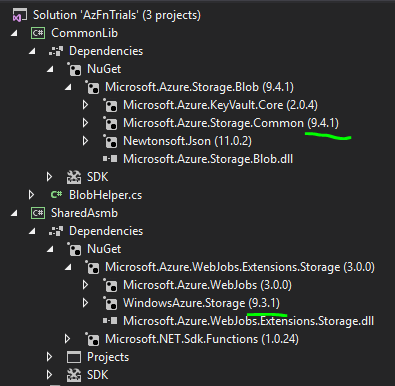 The mismatch occurs due to the Azure Storage versions included in the Azure WebJobs extensions and more general Azure Storage. The nearby AsFnTrials Solution Hierarchy screenshot highlights the mismatched versions. The easiest way to avoid this compilation error is to keep all of the code in a single assembly – e.g., move BlobHelper.cs to SharedAsmb and remove CommonLib (or remove it from dependencies). The downside with this approach is that sharing code gets more complicated, particularly when existing shared code exists.